It’s the eternal, age-old question: where did the remote go? While technology has sprinted past a lot of trouble spots (we don’t have to stay chained to the wall with the phone anymore, for instance), we’re still digging through couch cushions, upending side table drawers, and wracking our brains trying to remember where the remote was last. Fortunately, where technology has failed us, crochet has proffered a solution: the living room caddy, otherwise known as the organizer and remote holder. If you want everything in its place, then this is the place where the remote goes, and you’ll never have to look for it again. Of course, you can purchase these remote holders and caddies from Ebay, but where’s the fun in that (unless you need one poste-haste)? 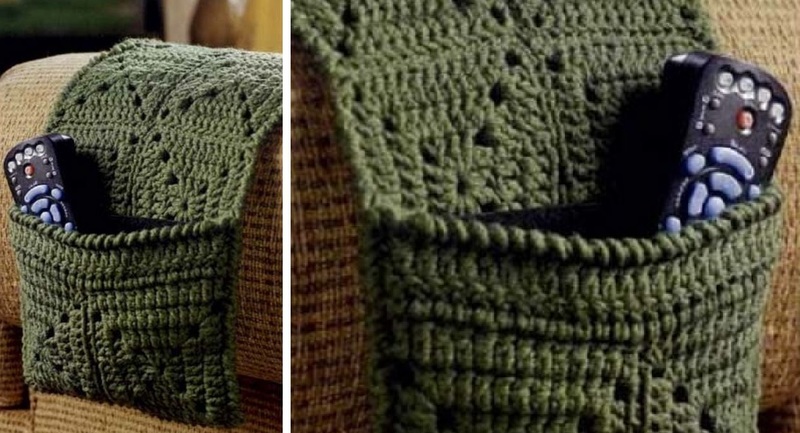 You can also find both knit and crochet patterns for purchase from sites like Ravelry – they even make caddies for walkers and recliners, and most are easy enough for the beginner to make. FitzBirch Crafts has another option: a Loom Knit Remote Caddy that you can customize to the size and specifications of your own remote. If you’d like to try out this option, you’ll need a Long Loom Knitter and a few balls of yarn (any type of yarn can be used, though the pattern suggests using something like wool in a variegated pattern), along with some scissors, a sewing needle, and thread. If you’ve never used a Long Loom Knitter, FitzBirch Crafts has you covered with a video tutorial of how to use it. If you enjoy using it, FitzBirch has several other knit loom projects you can try, such as a scarf, leg warmers, or market bag. Once you’ve gotten the hang of loom knitting, it’s simple enough to create a piece and then sew it up in any way you like. Ebay sellers have plenty of options for you to purchase if you’d like to forego the crafting experience, or if you want to purchase a pattern, you can find several at Ravelry. Find the free loom knitting remote caddy pattern at FitzBirch Crafts, and if you want to keep up with their free patterns, follow them on Facebook as well.